In case it’s escaped your notice this last week, the Annual Hammer trip abroad has been confirmed – we’re off to Breslau, Poland! The trip takes place on the weekend of 7-9th June, and it’s going to be a brilliant experience. Breslau is a stunning medieval city, steeped in European history. Direct flights are available at reasonable cost from Standsted and Luton airpots, and there are already 10 Hammers booked to travel. What more could you ask for? 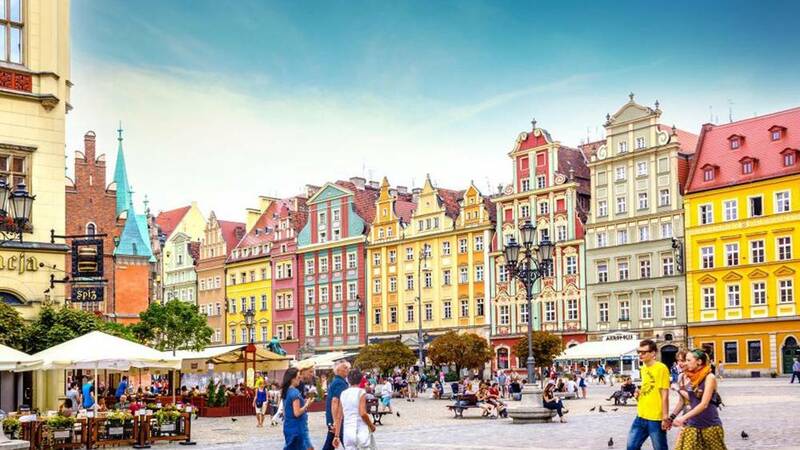 Join the Breslau WhatsApp group to sort accommodation – similar to previous trips, this will be a combination of Airbnb for those wishing to share or reduce costs, and hotels for the well heeled who prefer their own space! It’s entirely up to you. Don’t delay – flights are still cheap, so get in there while you can! Could this be a World’s First? A chess match in a brewery?? 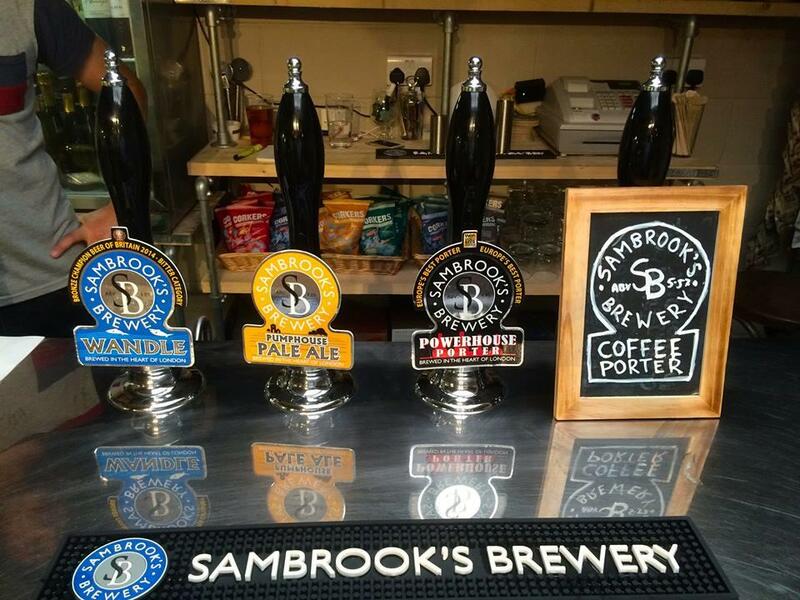 Yes, the mighty Hammer is taking on the slightly-less-mighty Battersea Chess Club over 14 boards in a local brewery – Sambrook’s! A brilliant confluence of many enjoyable things, this is going to be a fantastic afternoon of entertainment. Places are going fast, so sign up soon if you want to be involved!! The odds of winning a prize are well over 50% , so you don’t even need to be that lucky to win something!! 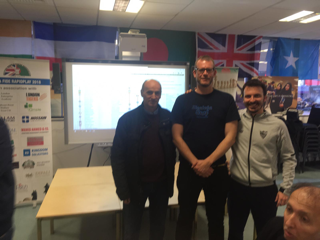 After the huge success of their annual big-money Rapdiplay tournament, our good friends in East London, the British Bangla Chess Association, have now launched a MONTHLY Rapidplay competition, and I’m pleased to report that the big money prizes are still there!! 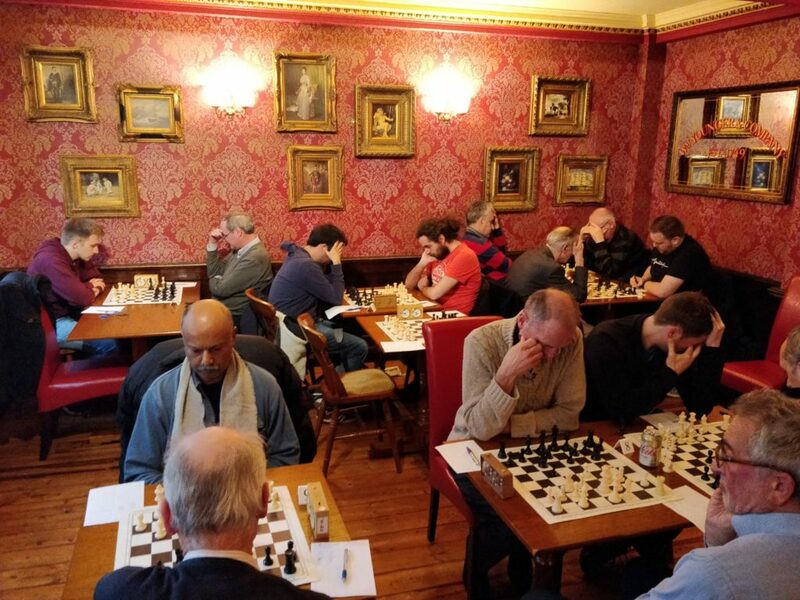 Starting Sunday 27th January, and hosting up to 60 players per month, the competition will have Open (no limit) and Minor (Newcomers up to 80 ECF) sections, with prizes for 1st and 2nd places, plus several grading prizes – plenty of chance to win something! Dates (all Sundays): January 27th, February 24th, March 31st, April 28th, May 26th, June 30th, July 28th, August 25th, September 29th, October 27th, November 24th, December 29th. Cost: £20 for ECF Silver or Gold, £27.50 for ECF Bronze or non-ECF, and £10 for all entries in the Minor section. As usual, we expect this will be a brilliant competition, and the BBCA do a fantastic job in their local community – well worth your support! Thames Valley Division 1 – Hammer Riding High! Our Thames Valley team are continuing their unbeaten run in this season’s league. We ‘stole’ a victory from Ealing A on Monday night, who put out a very strong team. We now sit top of the table, and are the only unbeaten team in the league. After Surbiton’s 5.5-2.5 win at Wimbledon A, we also have a game in hand over our nearest rivals. The purists amongst us will know that since TV records began in 1974, Hammersmith have never been Division 1 champions. Indeed, the last dozen years has seen honours rotated pretty evenly amongst Wimbledon, Ealing, Richmond and Surbiton. 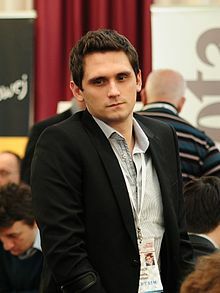 2016 French Champion, Celtic Tiger, and all-round top player, GM Matthieu Cornette will be gracing the Anvil on Monday 11th February form 7.30pm, for an evening of chess talk! Matthieu will be providing a 2 hour talk and discussion, focused on club players in the range 100-150 ECF, so this will be of massive interest to many at Hammersmith. 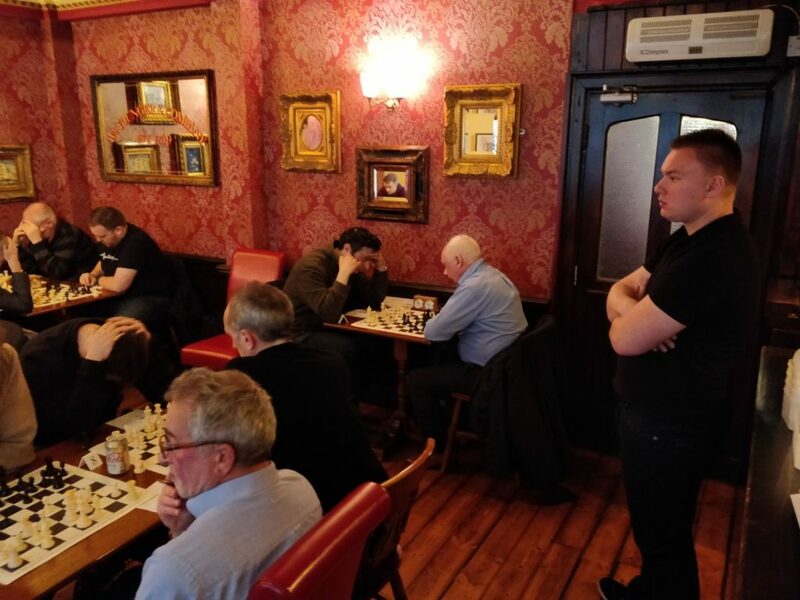 As if one GM isn’t enough, on 29th April we will be bringing you another evening of top-level chess instruction, humour, debate and anecdotes in the form of media-star GM Daniel King! A GM since 1989, Daniel received huge plaudits for his coverage of the 1993 World Chess Championship on UK Channel 4, and has gone on to have a hugely successful career in chess broadcasting and media, with highlights including coverage of Kasparov v Deep Blue, work for the BBC, and even Cilla Black! Daniel is a top level tutor and instructor, with a very successful YouTube channel, and remains a top British player. He’s also a native of West London! Couldn’t be better. This will be a popular evening, so if you sign up as an ‘early bird’ before 10th April, it is only £7 per place, rising to £10 thereafter. Tickets are exclusively for Hammer members up to March 31st, so don’t delay to secure your place amongst the lucky 48! Stay tuned in the next few days for write-ups on the first round of the Hammersmith League Rapidplay, and some of this week’s games! The Muswell Hill gang mounted a daring raid on Mother Anvil last week, and were met with Fire and Hammer. Yes, the Middlesex Division 2 circus was back on the road last night with a round 3 clash between our clubs. Hammer has started well in this Division and Captain Clueless wanted to notch up another good performance before the Christmas break. Now I know this is the season of goodwill and peace on earth is what we all should be embracing, but when it comes to competitive chess, this is a step too far for Hammerites! So, would it be “The Nightmare Before Christmas”, or a “Miracle on 34th Street” scenario?? Hammer got an early Christmas present when Muswell forfeited boards 7 and 8 mid-afternoon. Frustrating for Bond and Sorted, but the two of them still turned up to support the team. True Hammerites to the core!! On Board One, Zeus was playing like a God should – he had snaffled the exchange and seemed to have everything under control. Unfortunately, his opponent was a Prometheus in sheep’s clothing and got some central passed pawns rolling. Zeus struggled to halt their relentless march but the pieces or fates were aligned against him and he had to resign. Hammer pegged back to 2-1. Chris had put Hammer 3-1 up. Dead-Eye was the last to finish on board 3 and although a pawn down in an endgame, pressured his opponent on the clock. This was a fantastic demonstration of nous and chess experience in action. He literally willed the win and in the words of Picard – he made it so. 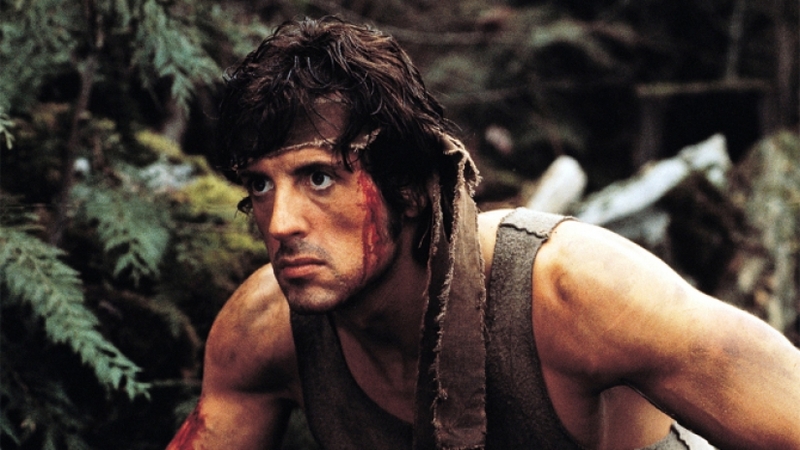 Watching Dead-Eye in action is fascinating – he summons amazing focus and willpower to every struggle. He is totally immersed in the moment and is the epitome of Hammer Chess. Board 4 was Brexit territory. Our version – unlike real life – is in superb form this season. He is currently 3-0 in individual games so far – could he make it 4-0? The answer was an emphatic yes – he won at a romp – with a strategy of building pressure on the c and d files and winning material. He is definitely on the road to rediscovering his best form. Hammer over the finish line 5-1: victory secure. Pandit on Board 5 was involved in one of those games where he had an edge but deft liquidation by his opponent allowed him to secure a draw. Frustrating for our man, but he still kept the scoreboard ticking over. Hammer 5.5-1.5 ahead. Finally to the Suit, who has a window to play a lot of chess. He is currently on garden leave and hence not subject to the demands of Italian banks or financial markets. He is able to enjoy his chess without serious distractions. Basically, he massacred his opponent – he was a rook up early on and from there on in it was simply a matter of conversion. This he duly did and delivered another point to the Hammer side. Hammer currently at 83% and heading into Christmas in fine fettle. There will be tougher challenges ahead, with Harrow, Albany and Hendon encounters in January, but captain Clueless is content and ready for the dietary and alcohol excesses of the Festive Season. Part One of the Middlesex 2 Odyssey is done and dusted – roll on Part Two. Hammer 2 Middlesex Division getting it done. Merry Christmas and a Happy New Year to one and all. Starship Hammer 1 has locked into orbit around the familiar neutral planet of Citadines for the next week for the two final matches of the mission. 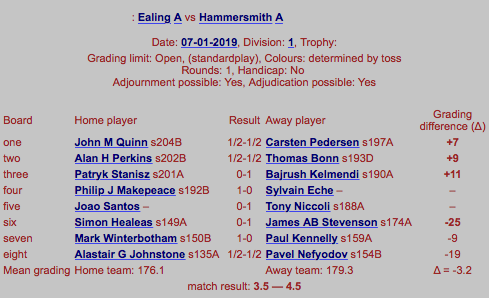 The season-long goal to boldly go to Division 2 of the London League has been achieved, thanks to the outcome of the Albany-Kings Head clash, with victory for the latter ensuring that Hammer is secure in second-place and guaranteed promotion. Welcome to the final report of the 2017-18 mission and the voyages of the Starship Hammer 1. Hammer 1 has been totally galvanized by the achievement of promotion and the crew members are ecstatic. Thanks to the actions of Kings Head the primary goal has been achieved – Hammer 1 is now a Division 2 team in 2018-19. Now is the time for mind reset and refocusing now that the mission goal has been stretched. This is not an easy task and Clueless is concerned that the team may be demob happy and not able to summon the will to finish the job. Team selection will not be easy with Sydney absent for the first game and Forza for the second. There is one lesson this year-long struggle has taught us – Caissa can send the odd curve-ball anytime. Returning to the familiar surroundings of Planet Citadines, where Hammer is undefeated this season, is a help as familiarity of the combat zone will produce the necessary will to win the Division and get promoted as champions. The first match saw Hammer taking on the planet of WanWood, a binary system in the NE quadrant of Londonium. The final match one week later will be against an alien species called Wombles 2. They inhabit a Common planet in SW Londonium and are apparently obsessed with racket sports as well. Victory in both clashes would result in mission accomplished. So many factors for Clueless to contemplate… please read on. Clueless was non-playing captain and as usual displaying pre-match nerves. His slightly frayed demeanour is put at east when WanWood concede victory by walkover on board eight before the match has even begun. Spock being the excellent and logical first officer he is, made the generous decision to allow Brexit to take his place. A typically unselfish gesture by one of Starfleet’s most decorated officers. The scoreboard then moved along swiftly with T-Bone in crushing form and totally overwhelming his opponent with a ruthless combination of tactical and strategic pyrotechnics. This was French élan and flair at it’s best. Hammer at 2-0 and looking good. The next two results saw Loco and the Prof secure draws in games that rarely fizzled and despite their best efforts to create complications and tactics. Their opponents just played solidly and were obviously delighted to secure the half-point. Hammer now at 3-1 and looking well set. There then followed those moments as a non-playing Captain you dread. When events on the board wreck your air of quiet confidence. Pandit played a superb attacking game. He had trapped his opponent’s King in the centre of the board and his pieces had occupied the optimum outposts. His opponent’s pieces were totally restricted and he was running out of viable moves. Pandit was in complete control and was eschewing which way to win. Clueless had all ready mentally chalked up the win. What followed encompassed the beauty and cruelty of chess. Pandit missed a tactical shot and his opponent won a piece with a clever check. Pandit was rocked and then reconciled himself to the new situation on the board and started to fight for the draw. He strained every mental sinew but his young opponent kept his cool and saw through every trap that was set. This was a vary mature performance. Hammer pegged back to 3-2 but it was more than a win – especially as the game was virtually won for Pandit. On board 3 Wily had a bad-tempered game with his opponent making various assertions to his Captain about our Chairman leaving the room when it was his move. I can report this was a very poor version of the infamous Toiletgate story from the bad-tempered Topalov-Kramnik match of yesteryear. However, I also know that our Chairman was not well and had been extremely ill that week. Anyway, there was no mobile phone analysis going on the Citadines facilities. Wily countered by pointing out that his opponent was not writing the moves down when the latter thought he was down to the last five minutes. His opponent was not aware that the digital clocks added 20 minutes once you made the time control. It was all handbags at dawn to be honest. Wily took revenge by pursuing the game to the very end although it was a total lost cause. Hammer pegged back to 3-3 and a full-blown wobble was in progress. Zeus then contrived to totally misplay a drawn position where he was slightly better. Obviously, influenced by the ongoing events on Board 2 and the reversal of fortune for Pandit – Zeus went for it. This was a classic case of over-reach and sacrifice for the team and as is the case when reaching for the firebird even a God can go down in flames. Caissa admired the nerve but dished out a cruel dose of humble pie. Hammer now 3-4 down and dreams of the title disappearing down the Swanny. Clueless in despair. This is where the men of the hour step forward to defy the odds and by sheer will-power drive the team towards victory. Fortunately, for Hammer, those men were Forza, Dead-Eye and Brexit – the new and the old of Hammersmith Chess Club. Tommaso displayed and deployed all his skill to win a drawn game. This was a dead drawn King and pawn ending with correct play from both sides. However, his opponent overplayed his hand. Forza sacked a pawn and activated his king. In a flurry of moves and the time counting down he checkmated his opponent after queening a pawn. The Forza is strong in this Hammerite. Dead-Eye is in superb form this season and tonight when Clueless needed him most he yet again came through. 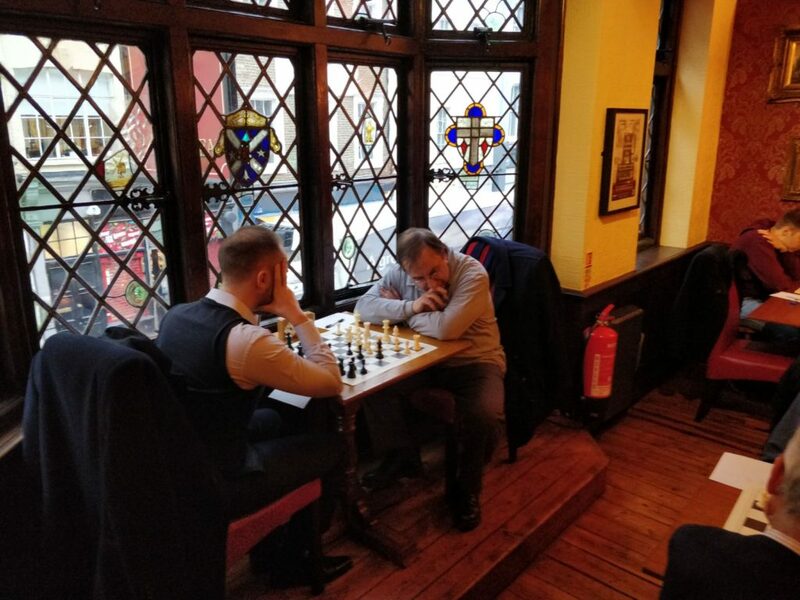 His opponent was a novice to the London league and completely oblivious to the idea of resignation. Dead-Eye was getting frustrated as he kept dismembering his opponent, but rather like the Black Knight in Monty Python and the Holy Grail, he kept dismissing the loss of material as mere flesh wounds. In the end his lone King was facing Dead-Eye with a Knight and three pawns. He still didn’t resign. Dead-Eye was incensed but kept his cool and saw the game through to victory. Hammer at 5-4 and some momentum had been clawed back. At last to Brexit – the match and the Title were on the line – would he the hero or the villain? Yet again defying the real-life Brexit fiasco – our nicer version – played a peaky blinder after a non-stellar first half of the game. However, Brexit is resilient and obstinate when he has to be and is a passionate and proud Hammerite. His is a definite true-blood. After dancing on the edge in the early middle-game he was able to open the h-file and free his imprisoned rook. He then smoothly moved over to the attack and his pieces effortlessly flowed towards the enemy King. His opponent resigned gracefully when the threats became overwhelmingly. Yes, you read it here Brexit had dragged us over the line to the border of the promised land. A great performance by Jeremy and a vital 6-4 victory was achieved. Hammer beamed back to the safety of our Starship and recuperation after this wild-ride of a match. The title was still on but a huge hurdle still had to be overcome in the form of our final opponent – the fearsome Wombles 2 to complete our mission. Clueless relieved and the dream was still alive. Clueless has been in the think-tank for the last week and contemplating the enormity of the task and the right team to achieve it. After consultation with Zeus our Chess God asked to be stood down – he felt even a God can get chess fatigue after a long season. Forza after his brilliant run asked to miss the encounter for personal reasons – she is a lucky lady is all I will say. So, our landing party was two men down. Fortunately, Sydney moved heaven and earth in Crypto world to make himself available and Clueless contacted Pickle to answer the call to arms. The crew was complete. Our opponents Wombles 2 have a fearsome reputation and have excelled this season in the alternative world of TV Division 1. They would not be pushovers and with their need to clear up litter wherever they go Hammer had to be on guard to ensure they were not consigned to recycling. The night of destiny was upon us. The night did not start well with Sydney succumbing to a debilitating virus in Crypto world and Brexit en-route was side lined by a desperate 999 call from Ice world. Clueless stepped into the breach for Sydney but there was no time to cover Brexit (chess mirroring real-life again!!). Hammer 0-1 down without a piece moved in anger. A tough task just got harder. The omens were not good and things did not get any better. Things that turned definitely for the worse when Spock lost on time and Clueless played a horrendous game. Pavel held his hand up as did Clueless – it was just total rubbish – we gave the recycling Wombles everything they wanted on a plate. Hammer down 0.5-3.5 and things were about to get worse. Clueless was observing title dreams disappearing before his eyes. It is often said that the darkest hour is the hour before dawn. Hammer just had to survive and hang on till any light appeared. The first sign of dawn, signally a change in fortune, arrived in the form of Loco. The Flying Scotsman gave Hammer hope with a beautifully played attack. The sight of his opponent’s knight pinned to the enemy King, and nowhere to go, produced a pleasing picture. The fightback was on. Hammer at 1.5-3.5 to the bad. The dawn continued to break as Wily employing his usual set-up created a passed pawn. His excellent endgame technique did the rest – Hammer back to 2.5-3.5. Hope was suddenly on the horizon. The next piece of good news was Pandit who used his opponent’s time trouble to improve his position and then win material. All of the sudden Hammer had drawn level. However, we still needed two points from the last three games to secure the match. If you were a betting man you would have put your faith, and money, on a three-legged horse winning the Derby rather than Hammer pulling it off. Hammer now tied at 3.5-3.5. Clueless was literally hoping and praying for a Citadines miracle. The problem was Dead-Eye looked dead in the water and Pickle was facing nothing better than a draw. This would mean a drawn match and the title chance gone. Dead-Eye playing an incredibly complicated against a well-known foe in the form of Womble, Nick Grey found a resource. This seemed to turn the tide and gave hope that a draw or even more unlikely a win may be there. This was excruciating to watch and terrible on the nerves. The last part of the game saw Dead-Eye’s King on an open board trying to avoid mate. One mismove would be curtains – somehow Dead-Eye negotiated it all – with a huge dose of luck and secured the draw. Hammer now at 5-4 and all eyes turned to Pickle. I suppose it had to come down to this. The last game in the last match of the season was the one that would decide whether we would win the Title. You could not write a better cliff-hanger of a tale. Pickle was a pawn down in a knight and pawn endgame. His knight had struggled all-game to find a decent square – luckily, he was able to activate his king and eliminate the passed pawn on the Q-side. Unfortunately, this left the white king in a better position and a three pawns vs three pawns on the K-side. Playing accurately and betraying no signs of nerves Pickle probed, maneuvered and by sheer force of will created a passed pawn on the King side. By some Football Radar Voodoo, he also got his King and knight into the optimum positions. It should have been a draw but Caissa took a hand and decreed that on this night Hammer would not be denied. Adam was able to force the pawn through and would have won but his opponent ran out of time. A win for sheer guts and determination. Clueless is now lobbying Starfleet command for the Freedom of Hammersmith award and other titles for this sterling performance. Pickle had saved the day. Hammer had won 6-4. It was not pretty, it was not great chess but it did not matter – we had earned the right to call ourselves Champions. That indeed is something special, Clueless was in shock – this really was a Phoenix from the Ashes scenario. Once again Hammer had come back from the Dead – We are the Champions!!! The celebrations went long into the night. This has been a great group of guys who have fought every inch of the way to achieve what they have achieved, They, really are Champions – one and all. We won every match played at Planet Citadines! Captain Clueless signing off – mission accomplished. May the next mission by just as enjoyable and successful. Bring it on!! We ended our season in London Division 4 last Wednesday with a solid 6-2 win against Kings Head. That safely rounds off our 2017/18 campaign with a solid 7.5/12 points, and with several matches still to play it looks good enough to secure us a 4th or 5th place finish. Kings Head’s lily-livered crew came down with a bout of scurvy close to shore, and could only secure 6 players for the final match. 2-0 to the good for Hammer but frustrating as we had the strength in depth to go toe-to-toe across all 8 boards. Blair and your captain Dave the unfortunates to miss out. Within 45 minutes we were 3-0 up as John quickly made short work of their Board 6, playing outside in the Citadines’ atrium. Fair play concentrating in those noisy conditions. 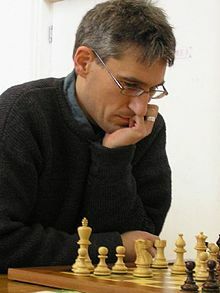 John secured a bothersome pin against Knight and Queen, with his opponents Bishop – and best hope of defence – locked-out via his own pawn chain. A sharp attack followed which exposed the King and allowed a brutal checkmate. They shared a beer apiece as they deconstructed the match in their analysis. The other games were anything but plain sailing, however. Gokhan and Rich won matches they both could easily have lost. Gokhan lost his Queen, managing to nab a Rook and Bishop as some compensation but he was struggling…! Thankfully his opponent obliged and played a couple of passive moves that allowed a double-attack on Queen and King. That was that. Meanwhile, Rich was a whole Knight down from around move 10, but continued to ask questions, which were duly answered! Perhaps an element of complacency crept in, as duly conceded by his magnanimous opponent in the pub afterwards. The unlucky crewmembers made to walk the plan were Jeremy and Dan. Jeremy wasn’t best pleased with his work, and conceded it was one of his weaker games of the season. One too many blunders against a prepared opponent was his undoing. Dan got himself into what looked like a relatively even endgame position against his Italian counterpart, but failed to hang onto a crucial pawn which proved to be decisive. More radical forcing tactics were required which meant complications – never easy with an ailing clock. And thus it finished 6-2. Finally we rounded off our evening by sharing a couple of beers with the Kings Head crew in The Ship Tavern, just a few short minutes from the Citadines venue. Definitely recommended and I’ll be heading there again…! Great little boozer. Middlesex League – Final Game & Season Roundup! 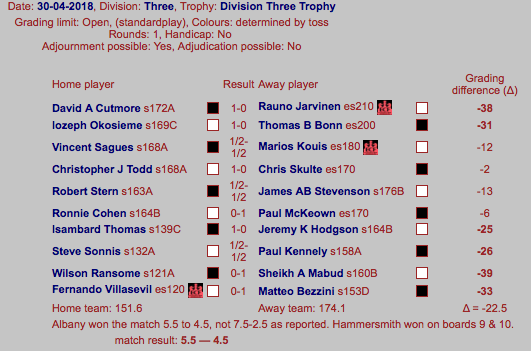 The Middlesex League season has drawn to a close with the last match of the season for Hammer 2 in division three. We descended on Kings Head’s pub venue with the enviable mindset of knowing we were already promoted. It was a chance for some of Hammer’s newer recruits to stamp their mark on the league, and for the MVP contenders to rack up one last win. At the other end of the room, Jeremy and Wyatt sat down on boards seven and eight with a tiny grade advantage. What’s opponent played quickly, exchanging down to a pawn endgame that was very difficult to hold. Here Wyatt’s rigorous endgame training regime, courtesy of the John White Drinking Club, came into its own. He played very methodically, queening with one tempo remaining to stop his opponent doing the same. Boards five and six were occupied by John Ryan and Dipender, both of whom have been integral to the team’s success this season. John’s endgame was incredibly sharp, with both players possessing plenty of heavy pieces and weak squares. Coupled with five minutes each on the clock, there was no way they could calculate all the variations. John mustered up a brave attack on the enemy king, but couldn’t quite find checkmate. Sadly this left his own king very vulnerable, and saving it cost too much material and the game. And so our fate was left in the hands of Charlie and debutante Adi. From the outset, it was clear Charlie’s opponent was not set up for a sharp game. Charlie tried his best to spice up the position, rejecting two draw offers, before finally accepting the third, by which point his position was slightly worse. With two matches outstanding, we can only be caught by Hendon, and only if they thrash Kings Head away from home. 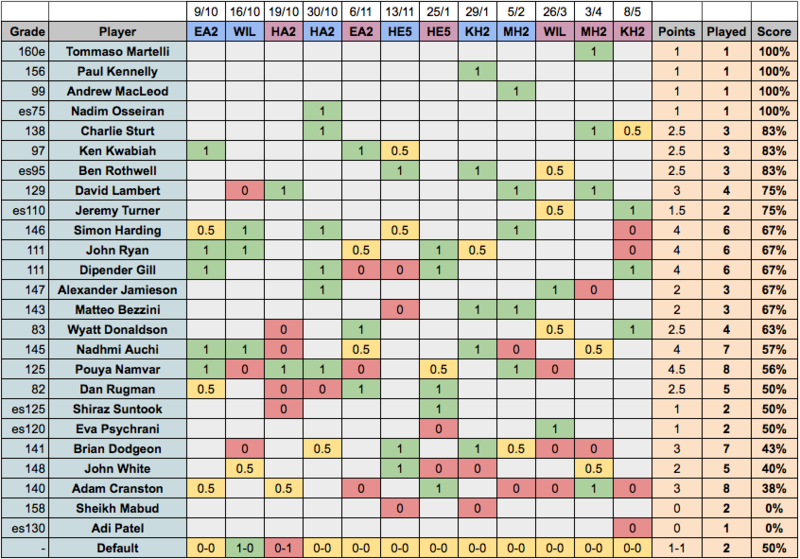 Adi becomes the 25th player to play this year, three short of last year. With eight of the club’s top players ineligible due to first team nomination, I’m extremely proud of the strength in depth the club now possesses. Having seen so many great performances, this year’s MVP will be a very tough choice. After the Greek Tragedy in W1 there had to be a rebound in WC1V. Redemption was the only course on the menu for the boys of Hammer. Welcome to the latest boy’s own adventure of the voyages of the Starship Hammer 1 and its one-year mission to boldly go to Division 3 of the London League. Hammer 1, after undergoing repairs and mental retuning, has locked into orbit around the planet Cave-N-‘Dish in the Holborn quadrant of the Londinium galaxy. 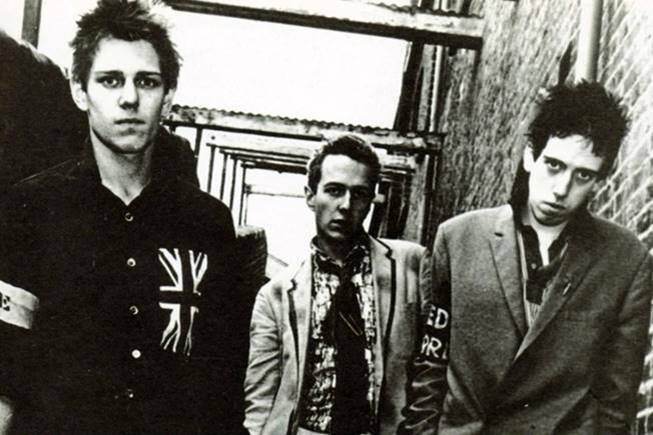 The mission was a delayed encounter thanks to the machinations of “The Beast from the East” and hence was played at the Citadines complex rather than the home planet of the ‘Dish. This was a task again deemed critical by Starfleet – with the added pressure of Hammer 1 having to regain their collective mojo. Clueless, despite missing Sydney and the Suit in the landing crew, was glad to welcome back the talents of Wily and Forza. This was destiny time – seize it and Hammer 1 were firmly back on track. Hammer got a break before the match started when Cave-N-Dish forfeited board 10 – Hammer 1-0 to the good. Hammer now at warp speed 2. Next to join the party was Pandit, who won in less moves than Wily but his opponent consumed large amounts of time and hence he spent longer at the board. 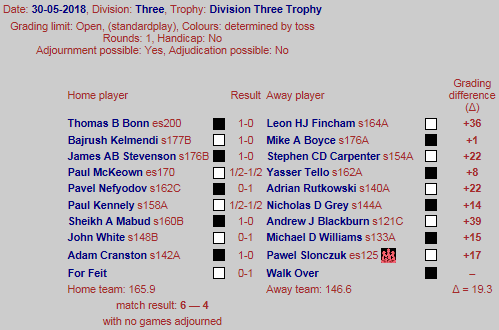 This was another chess massacre and Pandit continues his return to form. Hammer now at 3.0 warp speed. Next to extend the Hammer lead was Forza – employing his usual tactic of consuming more time initially and sacking a pawn in the opening for dynamic piece play. 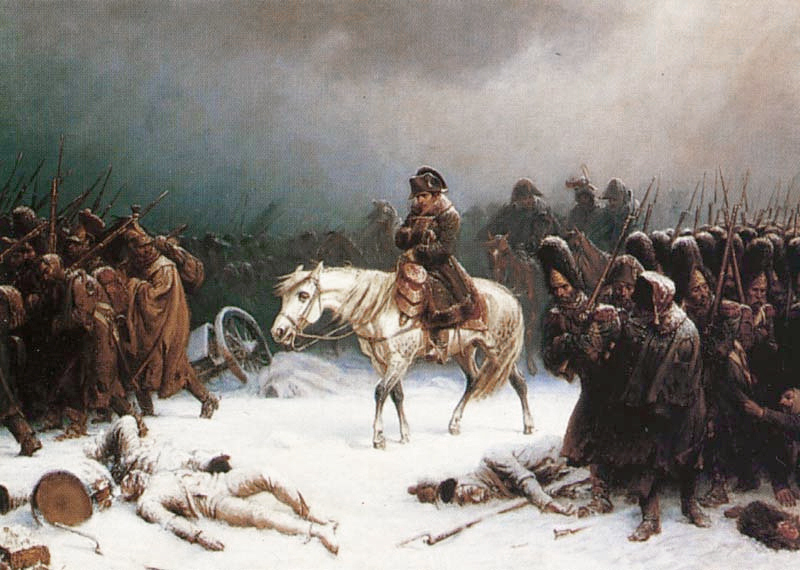 In no time his pieces were swarming over the White Kind and the end followed very swiftly. Hammer cruising at 4-0. Hammer were pegged back in the next game when Brexit blew a winning position and succumbed to a tactic that had more points to it than even his opponent saw. Indeed, it was only in the post-game analysis he realised the full implications – I will say this only once – I was gutted for Brexit and frustrated for him. Despite his stance on the Brussels matter he is a good bloke and a devoted Hammer player. His form is uncertain and he has definitely hit the Irish Border conundrum. I am sure he will solve it, unlike HM Government, and move back to his best form. Hammer stuck at 4-1. That was the only setback of the evening. Loco playing a Kings Gambit was in scintillating form – the game was a real throwback to the Morphy-chess era. It was great to watch and demonstrated that as well as being an accomplished positional player, Loco can, when required, go “Loco tactical“. The ending was prosaic with Black losing his queen in one move or two Hammer now at 5.1 warp speed. The Prof, with the black pieces, faced an opponent who was determined to keep the position as dull as possible. The Prof with the bishop-pair advantage probed, provoked, and induced square weaknesses around the White King. White’s position deteriorated rapidly and under pressure he succumbed to a tactical shot of Qxh4+ with White unable to take the Queen due to a bishop pin. Faced with a complete collapse in his position his opponent gracefully resigned. Hammer at 6-1 with the match victory secured. The last two games to finish were the top two boards. T-Bone on board 1 was facing a familiar face in LL chess – the captain of Cavendish 3, Bertie Barlow – who definitely knows a thing or two. T-Bone consumed huge amounts of time trying to find an edge in a position that was fairly sterile. 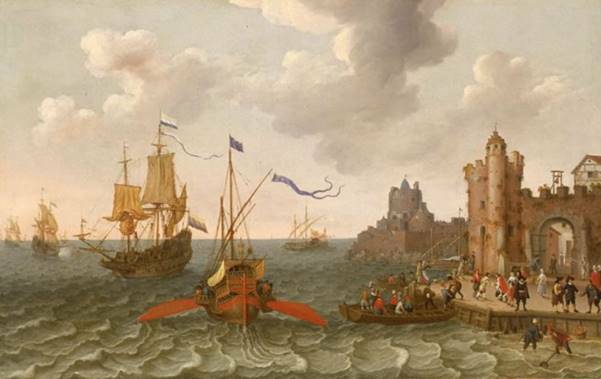 Despite having the two bishops he was encumbered by the fact that the position was closed and one of those bishops had defensive duties. Thomas is the most visually expressive player we have in the club – you can almost sense what he is thinking. How he achieved victory is beyond me, but he did – and that was purely down to sheer willpower and tenacity. Hammer at 8.1 Warp Speed. Zeus played in the only slow-play game of the evening. Why oh why do we persist with this anachronistic version of our game? It is an absurd and outdated option in the modern world of computers and busy lives! Rant over and now to the actual game. Zeus has been in uncertain form in recent weeks but tonight was the night he returned to form. Dominating an open c-file he induced and injudicious b-pawn advance form his opponent. This duly got consumed and then Zeus opened up the King-side. The game was adjourned at move 35, with his opponent sealing the move. Pub analysis indicates that Zeus is +1.7 and has multiple ways to win. The hope is that his opponent will see sense and resign, otherwise the game resumes next Wednesday. Hammer at 8-1 with one game adjourned. A dominating performance by the Hammer crew – they totally bossed the planet of Cave-N-Dish. Clueless announced part 10 of the mission had been successfully completed and has resumed his state of inner peace and contentment. There is an old adage that states every good run comes to the end. This is the best that can be said of a tragic cold Monday night in Fitzrovia. In scenes reminiscent of Medea and Oedipus Rex the Hammer 1 juggernaut came off the rails at the hands of Albany, crashing to our first defeat of 2018. Welcome to the latest instalment of the Starship Hammer 1 and its one-year mission to boldly go to Division 2 of the London League. Starship Hammer 1 has gone into orbit around the Alba planet of Wheatsheaf in the Fitzrovian quadrant of the Londonium galaxy. The upcoming encounter of chess mental gymnastics is laced with potential venom and hidden danger. The playing venue has alcoholic distractions available and there is a hint of a Welsh poetic voice in the air as well as shades of Animal Farm and 1984. This planet has ghosts from the past. Clueless is wary and concerned that there may be too many distractions and a possible air of complacency in the landing party. He is at fever pitch, the weight of expectation almost unbearable. Read on if you dar and see if you can spot the use of Newspeak in this report in homage to George Orwell. The team assembled on time, in the right place and in the right frame of mind. We had a strong team, confidence was high, the banter beforehand was spot on – surely nothing could go wrong. We had a new board one Rauno – aka “Sync” – a miserable play on the capital city of a great country – Finland. Sync playing on board one returned to chess action after a substantial break from the game. He was delighted to be playing again. Indeed, all seemed well at first and into the middle game. He had established an edge with the white pieces and was on the brink of launching a devastating queen-side assault with a free bishop controlling d8. Alas, a couple of mis-moves followed and he allowed black time to mount a vicious attack on the kingside. The end was swift and Hammer were 1-0 down. The T-Bone had an unnerving encounter of playing an opponent who always arrives 30 minutes late and then proceeds to play at Wily Ward Speed. Clueless counselled T-Bone on this matter beforehand and all looked well. Thomas was a pawn up and consolidating his position – he had two bishops versus two knights on an open board – he was in control and having a good think. Unfortunately, he placed his rook on b8 instead of c7 and this allowed a nasty white knight to jump in on c6 and pin his bishop. T-Bone has an excellent face crime face and I could clearly see his frustration. Despite strenuous and ingenious efforts, he could not avoid material loss and the rest of the game was a rear-guard action without hope. It was genuine daylight robbery. Hammer 2-0 down. Board 3 saw Zeus in action. Even for a God, Zeus has played a lot of chess this season and in recent games has displayed a touch of weariness. Other possible explanations are a recent trip to Olympus or the amount of beer consumption and his recent love for karaoke (see our @Hammer_Chess twitter account for evidence!). Whatever, the answer to this dip in form is, it initially continued in this match. 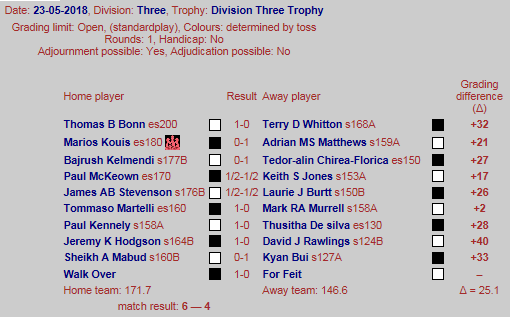 Zeus dropped a pawn in the opening – but this time there was no doubleplusungood ending as he fought back and equalised. A draw was agreed shortly afterwards – Hammer on the scoreboard but 2.5-0.5 down. Board 4 saw Sydney in his worst sober game of the season. Facing a Bajrush-style opening with the black pieces he got himself into a real positional bind. His strategy was totally malquoted. A desperado exchange sacrifice did not relieve the pressure on his position and the rest of the game was a matter of technique for his opponent. A truly horrible game for Sydney and very frustrating for him. It was just one of those nights when Caissa dished out a bit of humble pie. Hammer down 3.5-0.5 and Clueless reduced to downing pints and cursing Dylan Thomas and anyone else he could think of. Loco on board five would surely stop the rot. Indeed, he did, but the combination of a slightly annoying opponent and a fairly dull position conspired against him converting the edge he had. In the bar afterwards, he confessed to a bellyfeel about the game that indicated it was going to be a draw. Hammer trailing at 4-1 and stick in impulse rather than warp speed. Something had to change and the burden of recording Hammer’s first win shifted to the Prof. I have to confess Clueless was most anxious in his periodic visits to the board and altogether gloomy about the outcome. However, I forgot the Prof always takes the “Reverse Amber” approach (Rudd – I will not resign) and keeps throwing oil on the fire. This Lasker approach will always produce results, especially in mutual time trouble, and the Prof duly converted. The Prof along with Wily has more lives at the chess board than a cat, and his uncompromising approach will always yield interesting games that test the nerves of his opponent as well as those of his captain. The record does not lie and his record this season shows a clean sweep when he has played. Hammer now at 4-2 but still stuck in impulse speed and the core reactor was still misfiring. The fate of the match then moved to the next four boards and Clueless had assumed a more optimistic air. The outcome of the match was still to be played for and Hammer were well-placed in all four games. A definite case of plusgood. Board 8 saw potential player of the season Dead-Eye once again deep in thought. Paul really is a picture of concentration at the board as he summons all his willpower for the coming struggle. This night was no different as he went into ownlife mode and struggled mightily to force a win for Hammer. It was a tough game as his opponent was obviously settling for a draw and that is what he achieved. Hammer now at 4.5-2.5 and still in arrears. 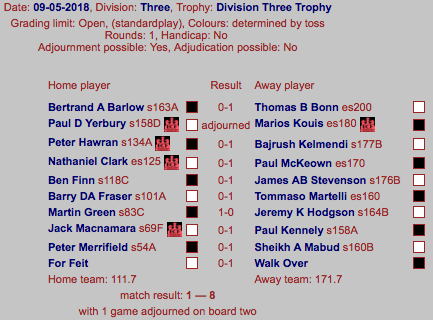 Pandit on board 9 once again rubbed Hammer salt in the wounds of his opponent, Charlie’s (Sorted) old maths teach, and scored a dominating win. I was so pleased for Pandit as he has had some tough losses this season and this was a return to form and most welcome. He induced a black-square weakness around the Black King and basically was threatening checkmate in a variety of ways. It was great to see Pandit playing effortless chess, it was total duckspeak. Hammer at 3.5-4.5 down. The Suit played a perfect game against a lower-rated opponent. Snaffling a pawn and exchanging down to a King and pawn ending. He then demonstrated technique forcing his pawn through and gracefully accepting the resignation of his opponent. It is a minitrue that he is returning to his best form. Hammer equalise at 4.5-4.5 – and like real political life, it was all down to Brexit. I must add a caveat here and state I have taken writer’s poetic license here to add to the drama of this report and Jeremy’s game was not the last to finish. I have to confess employing goodthink to produce this report. Brexit with the white pieces seemed to have everything under control despite his opponent controlling the f-file. Clueless was definitely not concerned and there was no hint of a hard border for Brexit. The conclusion was nothing to rectify here. Unfortunately, this was just one of those nights and nothing really went Hammer’s way after a couple of mis-moves on Brexit’s part the game was over and Hammer had lost 4.5-5.5. Clueless was distraught despite several pints of beer thrust into his hand he was inconsolable. On reflection I realised that nothing had changed – this is not newspeak – our destiny is still in our hands and if we play to our best we will go up and complete the mission. My challenge to the Hammer boys is it’s do-or-die time, the clock is at 11 minutes to midnight and we have to seize our destiny. Hammer will win through, we are too good a team to let this golden chance slip. This is not thinkpol on my part, nor fake news, but reasoned logic on how this team has performed this season. We will not be denied. I leave you with the match card and current division standings.